Evangeline Clement is honing her monster-hunting skills to become a haunt huntress like her mother and grandmother before her. But when Evangeline and her grandmother are called to New Orleans to resolve an unusual case, she uncovers a secret that will shake her to the soles of her silver-tipped alligator-skin boots. A spooky, funny middle grade adventure with a sassy, memorable heroine and a charming Southern feel, perfect for fans of Kate DiCamillo, Kate Messner, and Natalie Lloyd. Twelve-year-old haunt huntress apprentice Evangeline Clement spends her days and nights studying the ways of folk magic, honing her monster-hunting skills while pursuing local bayou banshees and Johnny revenants. With her animal familiar sure to make itself known any day now, the only thing left to do is prove to the council she has heart. Then she will finally be declared a true haunt huntress, worthy of following in the footsteps of her long line of female ancestors. But when Evangeline and her grandmother are called to New Orleans to resolve an unusual case, she uncovers a secret that will shake her to the soles of her silver-tipped alligator-skin boots. 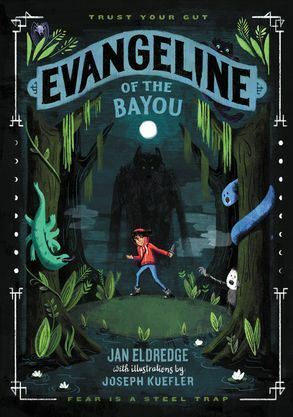 Set in the evocative Louisiana bayou and the vibrant streets of New Orleans, Evangeline’s is a tale of loyalty and determination, the powerful bonds of friendship and family, and the courage to trust your gut no matter how terrifying that might be.